Heat a heavy bottomed saucepan or Dutch oven over medium heat. Add olive oil and short ribs, brown on all sides. Remove the ribs and add carrots and onions. Sauté the vegetables until soft, about 5 minutes. Add all of the remaining ingredients and bring to a boil. 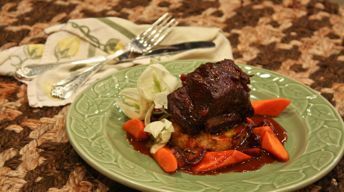 Return the short ribs to the pan; reduce the heat until the liquid is simmering and cover. Cook until the ribs are tender and falling off the bone, about 2 hours. Remove short ribs from the pan and keep warm. Place the liquid from the pan into a blender. Blend until smooth. Strain the sauce for a more finished sauce, or leave coarse for a rustic style. Season to taste with salt and black pepper.